Over the last ten years, the ukulele has seen a major growth in popularity in the US. Originally you just about couldn't find one outside of Hawaii, then there was a little bit of a ukulele fad, but now, the ukulele is as real in the modern music world as the electric guitar! Its been so amazing seeing the ukulele's popularity grow, which is mostly because of the amazing community that has come along with it. Where other instruments can be hard to learn and cause stress for people, the ukulele has come in the picture to save the day and give everyone a chance to be a musician. Because of this, it has created clubs, classes, and groups all over the country with hobbyists all playing the uke with the same goal; to have fun! 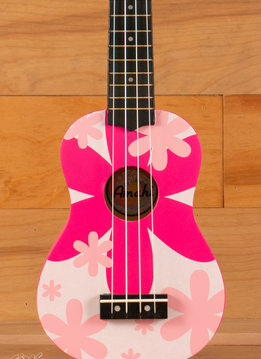 The ukulele has also grown in popularity in the school systems as well. Since they come in at much cheaper price than most instruments, schools have been open to stock classrooms with them, which has allowed music programs to blossom! At Sims Music, we have done whatever we can do encourage this community that is somewhat new to the music world. We always stock a large selection of the most beautiful Kala, Cordoba, Fender, and more ukuleles for sale. Our biggest investment has been the Sims Music Uke Jam! Now in its third year, the monthly ukulele jam has continued to grow attracting a large amount of people, of all skill levels and all ages. We could not be happier about being in the middle of this amazing community and are excited to see what the future holds for all those involved!